For this Iron Craft challenge we had to do something green, either the color green or something that was green because it reused something else. 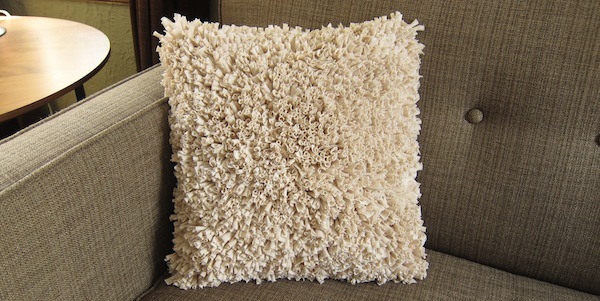 I struggled for an idea, but then realized some of my husband’s old t-shirts would work great to make a shaggy pillow like this inspiration from CB2*. I think the result turned out very chic. Not only did a reuse t-shirts that were meant for the trash in this project, but I also dyed them with tea that we didn’t care for and were going to throw away. (You can read about how I dyed the t-shirts here.) I also reused a pillow insert from an old pillow. I did have to buy the canvas I used to make the front of the pillow and the beautiful wool suiting I used for the back. I’ll admit this was one time consuming project. Nothing about it was hard, it just took time. I used about four and a half t-shirts to get the strips it took to make the front of this pillow and each t-shirt took me about an hour to cut down. 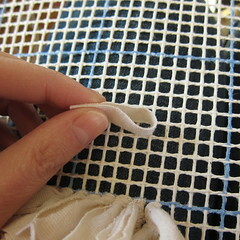 Then there was tying those 2500 strips onto the canvas, yes 2500! It took me a good week to get them all tied in. I think perhaps I could have skipped some of the spots on the canvas and not had the strips so close together, but it’s so plush! I felt a bit under the gun, because I was leaving on vacation and didn’t have the full challenge period to get it done. 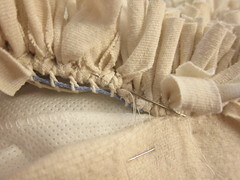 Once the front of the pillow was done, sewing on the backing went really quickly even though I did it by hand. As I said, I am very happy with the results, though as always there are a few buts. First, if I was doing it again I might vary the length of the strips a little bit to give a shaggier look. There is a little of it now because my tying isn’t perfect, but a little more might be nice. Secondly, I used t-shirts because the knit jersey doesn’t fray, but it does have what I call a dandruff. It sheds little flecks of fabric. It was quite messy while I was tying on the strips and I found it was best to work on it with a blanket on my lap. That kept most of the mess on the blanket which I could gather up and shake outside. Since I am not working it anymore the shedding has reduced, but not completely. I’ve tried running it through the dryer on delicate, vacuuming it, shaking it out and running a lint brush over it. I’m hoping once all the flecks from tying the strips on and pulling them have worked there way off the fabric the shredding will stop. 1. 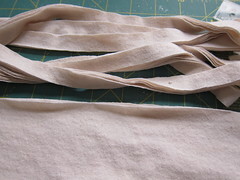 Cut the t-shirts into strips – I experimented with strip width and length and the size I liked best was 1 1/2″ x 3″. I got about 560 strips from one t-shirt (not using the sleeves) and it took me about an hour to completely cut it down. First I cut off the sleeves. Then I folded the t-shirt in half getting it as smooth as possible. 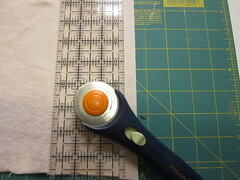 Using my quilting ruler, cutting mat and rotary cutting tool (make sure your blade is sharp), I cut the body of the shirt into 1/2″ strips, each strip was four layers. Keeping the strips in 4 layers, I cut off the end with two folds. Then I cut the strip into three 3″ pieces (actually 12 since each piece is 4 deep). I folded open the end and was able to get another piece that was two layers. So each strip gave me 14 pieces. Once I got to the arm holes I only got about 12 pieces per strip. Oh course, these numbers were based on using a men’s XL Hanes t-shirt. Different sizes and shirts are going to give you different amounts. I did cut a few strips with scissors, but found the rotary cutter gave me the most consistant strips and went the fastest. 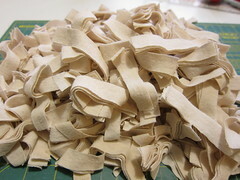 I tended to hand cut thicker strips. Don’t stress too much about your pieces being perfect, you will never notice in the final pillow. 2. 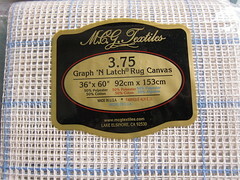 Cut the canvas grid so it is about an inch bigger than your final pillow. 3. Tie the strips on to the grid – Once again I experimented with different ways. One of the Iron Crafters, Ros, had told me you could just push the fabric into the squares of the grid and they would stay. I’m not sure if I was using a different sort of grid fabric or if my fabric strips were too thin, but I found my strips could easily be pulled out this way. So, tying them in was the best option. I tried a basic overhand knot and found it really added bulk. Then I tried a Cow Hitch knot and this gave the nicest look with the least bulk. Fold a strip in half. Put the folded end in one square of the grid, under a bar and up into the next square. Open the loop and insert the two ends through it. Pull to tighten. I liked to give my ends a nice tug so they curl up a bit too. I chose to put a strip on every bar in one direction. It gave for a really full plush pillow top. Make sure to keep your knots going in the same direction or you get holes (or at least I did). I worked in a square on my grid, so if I ran out of strips I would just have a smaller square pillow. I like a very full pillow so I worked until I had a 13″ square with which I would use a 14″ insert. 4. 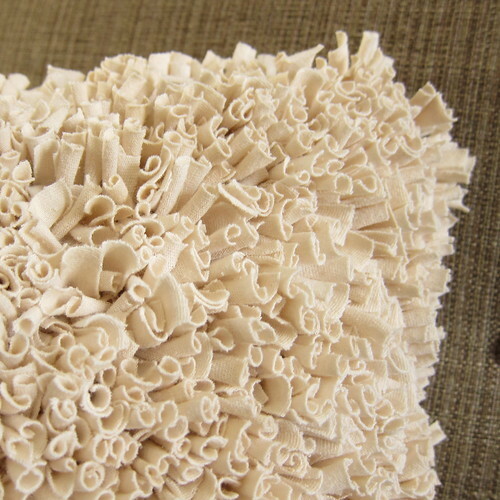 Assemble the pillow – Trim the canvas so it is about 1/2″ bigger around than the finished pillow top (area with the strips tied on). Cut a piece of fabric the same size. So for my pillow, the top and bottom were 14″. I had hoped to be able to use a sewing machine and zipper foot to sew the back of my pillow to the front, but the strips made the front just too thick and I wanted to be right up against the first row on each side. I found it was much easier to sew it together by hand. 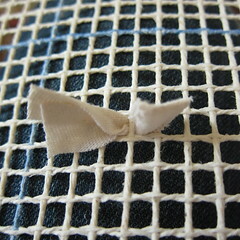 Pin one side of front of the pillow to the backing fabric with the fabric on top of the strips (the front of the pillow. Push all the strips down so they don’t get in your seam. 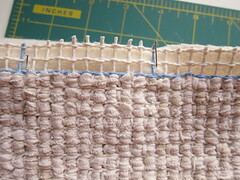 Hand sew across right against the row of tied on strips catching the knots in the strips as you go. Sew three sides together this way. I found it was best to only pin one side together at a time. Turn the pillow right side out and slide the pillow insert inside. Sew the last seam together. I pinned the backing fabric so the seam allowance was inside the pillow. 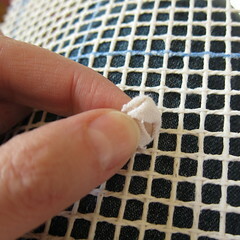 Then I finger-pressed the seam allowance of the canvas inside. I made a stitch in the fold of the fabric and then a stich in the front of the pillow catching the knots of two strips anda piece of the canvas in between them. I pulled the seam tight as I worked my way down. Knot off and you are done! I’m so glad I finally did this project and didn’t get intimidated by the time it took to do it. I feel like I have a pillow in my house that looks like $100 and I know it’s just some grungy old t-shirts. * By the way, I went and looked at the one at CB2 and it is much less plush. Their pillow just has strips of fabric sewn on a fabric backing. 6 years ago by Kat in Challenges , Craft Projects , Crafts , Iron Craft , Projects | You can follow any responses to this entry through the RSS feed. You can leave a response, or trackback from your own site. Oh, yes, I wouldn’t use that sort of stiff canvas for the proddy method. I use a loose weave hessian, which doesn’t have that stiffness to it, so that when you push the strips in it pushes the hessian threads closer together. 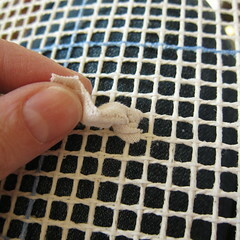 A rug hooking tool might have made it a little easier to do the actual hooking of the strips. It looks beautiful. I love this project. Since I collect graphic tees, I would probably do this in color blocking but I love this project. Another project well done and another project I might have to borrow. Beautiful work! I think it’s perfect! Wow, this is beautiful, Kathy! So much work, but worth it. I love how the ends of the strips curl like little flower petals. Wonderful job! You could have also used a crochet hook to put your strips in the grid. It looks great. I cannot find even 1 hour to do an iron craft project right now. It took almost a week of looking around my craft room to even find the green yarn. 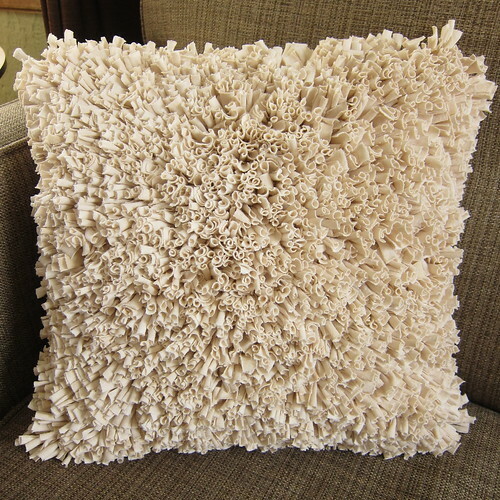 I love your cushion!The finished piece is well worth the cutting and knotting! It’s gorgeous as well as being green! This is breathtakingly brilliant! I would love to make one of these. Good for you for sticking with it to completion even though it took a while! This is absolutely gorgeous. And what a nice mention on Craft Gossip this morning! I love this so much! Can’t wait to try it out! 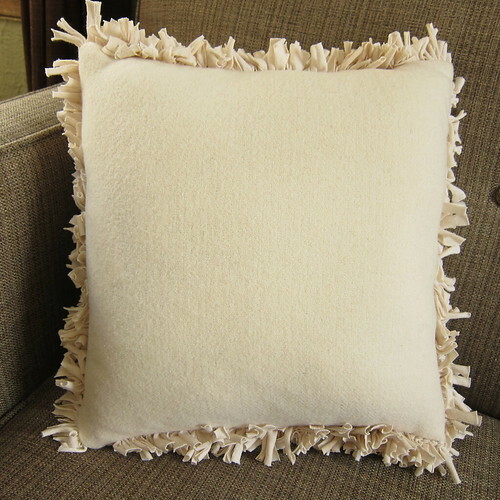 This tutorial really helped me to figure out how to make a Shaggy Cushion for a commission, however, instead of hand sewing around after, I machine sewed the Latch hook grid too my back panels using a zig-zag stitch, which worked really well. I also used Fleece instead of jersey which looks really handsome. Glad it worked for you! I’m one of those crazy people who really like to hand sew, but I can see how zig-zag would work well too. Lo voy hacer parecido pues pienso pegar las tirillas con maquina de coser mas fácil para mi,!! !